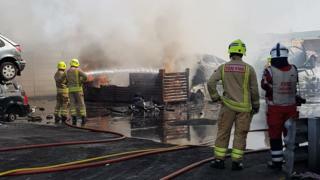 About 15 cars and up to 50 tyres have been engulfed by a fire at a scrapyard. Firefighters are tackling the blaze at Swansea Enterprise Park in Llansamlet. Mid and West Fire Wales and Rescue Service said they were called to the Dyffryn Close site just after 11:00 BST on Monday. There are reports of large amounts of smoke from the fires. Natural Resources Wales have also been informed about the incident. There have been no casualties or evacuations from the area reported.